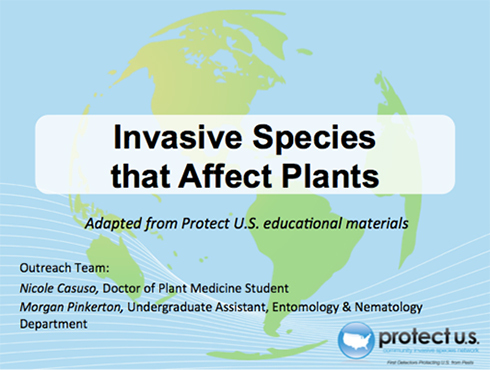 This module focuses on organisms that threaten agricultural crops and native ecosystems. Some of the recent pest or pathogen problems that have or could potentially impact Florida include: Mediterranean fruit fly, Ceratitis capitata; Oriental fruit fly, Bactrocera orientalis; light brown apple moth, Ephiphyas postvittana; European pepper moth, Duponchilia fovealis; spotted-wing drosophila, Drosophila suzukii; citrus greening, Candidatus Liberibacter asiaticus; giant African land snail, Achatina fulica; sudden oak death, Phytophtora ramorum; Bagrada bug, Bagrada hilaris; emerald ash borer, Agrilus planipennis; Asian long-horned beetle, Anoplophora glabripennis; and the old world bollworm, Helicoverpa armigera. You may request this presentation by contacting DPM students Morgan Pinkerton (morgan0402@ufl.edu) or Sage Thompson (sagemthompson@ufl.edu).